Help Wanted Lady – From SpongePedia, the biggest SpongeBob-wiki in the world! The Help Wanted Lady is a Lady that lives in New Kelp City, and works in the N.K.C Bank. She appears in three Episodes: Culture Shock (seen as a reporter), What Ever Happened to SpongeBob? and Porous Pockets. 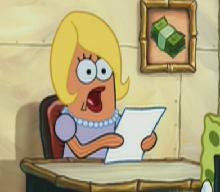 In What Ever Happened to SpongeBob?, she works in the Bank. In Porous Pockets she is one of SpongeBob's 497 friends and is extremly hard to spot. She also appears in Suction Cup Symphony as one of the flute players. It is unknown if she will ever appear as a Background character in future Episodes again. She is also afraid of Bubble Blowing and the Bubble Poppin' Boys, like everyone in New Kelp City is. She is possibly Diane Ortega from Culture Shock. This page was last modified on 3 September 2012, at 15:50.